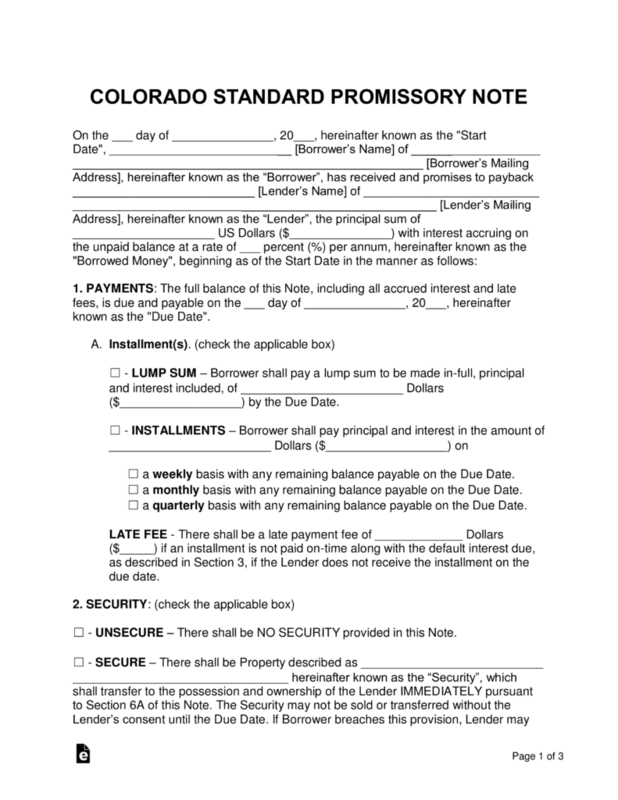 The Colorado promissory note templates are documents designed to assist two parties in concreting details in regards to a loan to help ensure the borrower pays the balance over time in orderly fashion. 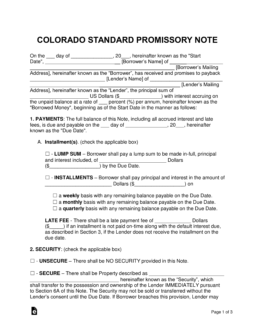 Below are two different forms of the Colorado Promissory Note, one designed to give the lender security in the case of a default, and the other without security. Secured Promissory Note – Incorporated in this note is the ability for the lender to recover lost financials in the case of a default on the balance. Unsecured Promissory Note – This note should mainly be used with a borrower that the lender trusts completely, as there is no built-in guarantee the lender will be paid. Under Colorado law, the legal interest rate if not otherwise specified is 8% per annum, however parties may agree to a written contract with a higher rate, not to exceed 45% per annum. C.R.S. 5-12-101 and C.R.S. 5-12-103.